Generic term for ceramic materials with high melting or softening points, high resistance to temperature change and good chemical resistance. According to international specifications (ISO, EN, DIN) refractory products are non-ferrous ceramic materials with a softening point (pyrometric cone equivalent) of over 1500 °C under temperature influence and according to standardized test processes (DIN 51060) (Calderys). If the test sample softens at more than 1800 °C, the material is referred to as highly refractory. 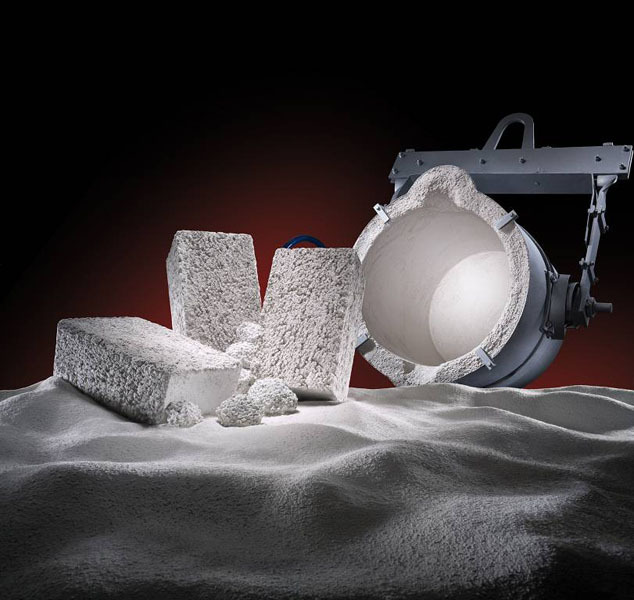 Depending on their application, refractory products withstand temperatures of up to 2500 °C. Depending on the thermal, chemical, and mechanical loads that they need to withstand, alumina-rich rock, fireclay, acid or basic products, tondinas, carbon bricks, silicate products, and special goods are used. For detailed characteristics of refractory products, please refer to SEW 912-917. Depending on the application, formed refractory products (Fig. 1 and 2) like stones, plates, shaped parts, crucibles, plugs, tubes etc. and unformed refractory products (plaster, concrete, cement, masses, etc.) are used Fig. 3, Foseco Foundry Division Vesuvius GmbH). Fig. 4 (Calderys) shows a ladle fed with refractory material and Fig. 5 (Calderys) shows an immersions bell made of refractory material for Mg treatment.